A funny thing happened, on or before June 12th, 2014, when we went to post a Geocaching Doc video on this blog. We found we could no longer copy and paste a description of a YouTube video! We were using Firefox, so no problem, lets try Chrome. Nope, didn’t work there either. Internet Explorer, same thing. We’re sure Google has their reasons, but it is a fact you can no longer copy and paste the description, or “about” a certain video, as they call it, on YouTube. 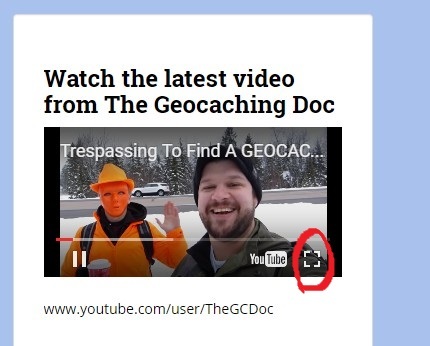 So not to be deterred, and inspired by another Geocaching blog, which posts the latest video of another Geocaching Vlogger to their blog, we threw The Geocaching Doc’s latest video up on the sidebar of this blog via a WordPress Widget. Works like a charm, and when his latest video came out on his RSS feed, it updated to the newest one, replacing the previous one, just fine. 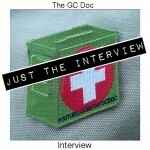 So we’re moving the Geocaching Doc to the side! The sidebar, that is, on the right hand side of this blog. Whenever he posts a new video to YouTube, it will immediately show up on the sidebar of this blog, via an RSS feed. Underneath the little thumbnail image on the sidebar, will be the Title of the video. When you click on said thumbnail image, the video will open in a large lightbox window in the middle of this webpage. In other words, the whole webpage will be dimmed out, and you will see the video full sized in the middle of your screen. We’re sure just about everyone has seen the so called “lightbox technique” all over the internet, and many just didn’t know what it was called. Now you know, and we’ll even give you the link to the wikipedia page on the subject, for further reading! We have discussed moving to the side with The Doc, and he’s OK with it. We too are OK with it, and feel it might even help this blog to load faster! A win-win all the way around. So you can, as you have for almost a year, see the latest from The Geocaching Doc right here on this blog! The Doc teams up with The Geocaching Vlogger to put together an EPIC WORLD WIDE FLASH MOB XI EVENT!